Zero turn mowers are dominating the market and they are increasingly being sought after by consumers that live on large corner blocks or bigger domestic properties. There isn't many in the market as most are to large and end up being a nuisance rather then a benefit although this Toro 32" cut is perfect for the job. Not to large so that it won't get in all areas and not too small to make the purchase pointless. Its zero-turn ability means you can easily manoeuvre around obstacles in your yard and reach those tight areas you normally would with a push mower. This would save you a significant amount of time and would also enable you to look after your property more easily as cutting your grass is no longer a draining and difficult task. 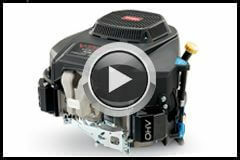 The Toro single cylinder engine is perfect for what this machine is designed to do. The engine is both efficient and reliable providing you with a product that will go the distance. It features OHV technology, cast iron cylinder liner, triple piston rings, over sized crankshaft bearings, die cast connecting rod, hardened valve guides, automatic compression release, full pressure lubrication and a large dual stage air filter! With this model it is all about the size. Nothing too big, nothing too small and 32" cut has nailed that objective right on the head. One single blade also means less wearing parts too. This really is the complete deck for homeowners with a slightly larger property. By installing independent hydrostatic drives our mowers obtain the ability of a zero turn, increasing manoeuvrability. Meaning you can get your lawn mowed faster, giving you more free time to do the things you love. 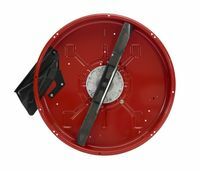 The independent drives are also anchored to Toro's unibody frame and reinforced with a cross member added performance and durability. This feature gives the user three modes, Trim, Tow and Mow. This inadvertently changes the max speed/ reactiveness of the mower when driving it. For example in 'trim' the mower assumes your close to the edge of the lawn where there is possibly obstacles near by. for that reason the mowers max speed is reduced and reactiveness is also slower making it safer to drive when trimming. 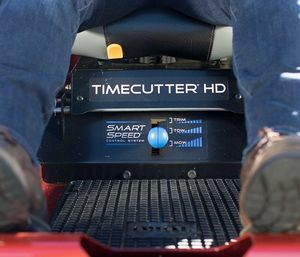 this gives the operator greater control over the zero turn when mowing! There is nothing more uncomfortable then a seat with a back rest that finishes to early. When mowing you want a back rest that is tall and supportive so you can comfortably ride any lumps and bumps as you mow your property whilst also giving you something to comfortably lean back against when cruising around your yard. 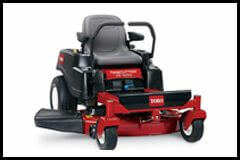 This Toro SS3225 offer exactly that with a 18" extra tall seat for optimum comfort!